Since the year 2000, Pantone has been announcing their colour of the year. 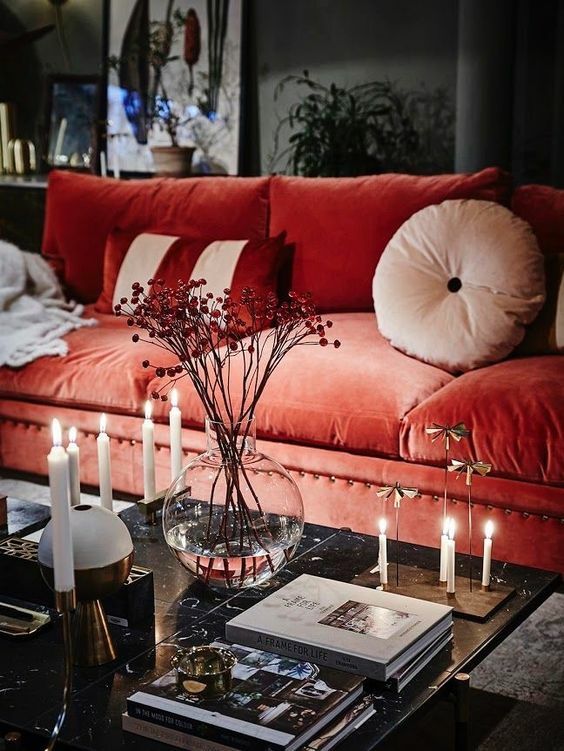 Eagerly anticipated by designers around the globe, the colour for 2019 is Pantone Living Coral. A soft orange with pink undertones. At first glance you may think this is an outdated colour but let me tell you more about the process and how you can use this beautiful colour in your own home. Pantone conducts a huge amount of research to establish the colour each year, taking into account the global political climate, current trends in art, design and entertainment and their vast banks of data on colour built up over the past century. Colour trends represent the current social environment and are often a backlash to a past trend. The colour for 2018 was a deep mysterious purple – Ultra Violet – and we have come almost half way around the colour wheel to a warm colour that is also its opposite in being a paler, warmer and softer hue. 2017 saw fresh Greenery as the colour of the year – a popular choice and one that has seen our love of natural greenery firmly placed in our decorating schemes. Looking back over the past century, it was in the 1920s that a colour similar to Living Coral made an appearance. This decade was one of great social and economic advances which saw the advent of exciting overseas travel to far flung shores, daring fashions with short skirts and fabulous jazz music. 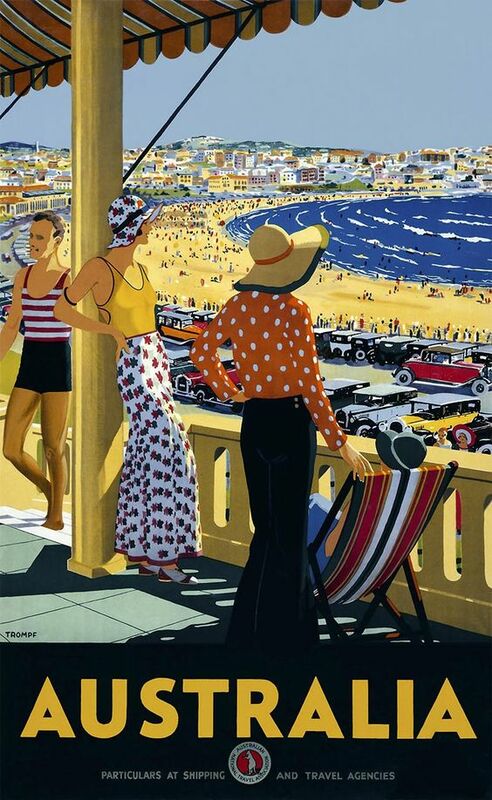 Look at vintage travel posters of the Art Deco age and you will see the common theme of warm colours running through them all. Times were changing and these warm colours made up the majority of the Pantone colour palette for those years. Although warm colours figured throughout the following decades they were either very soft pastel tones – as in the 1950s – or more definite psychedelic colours. 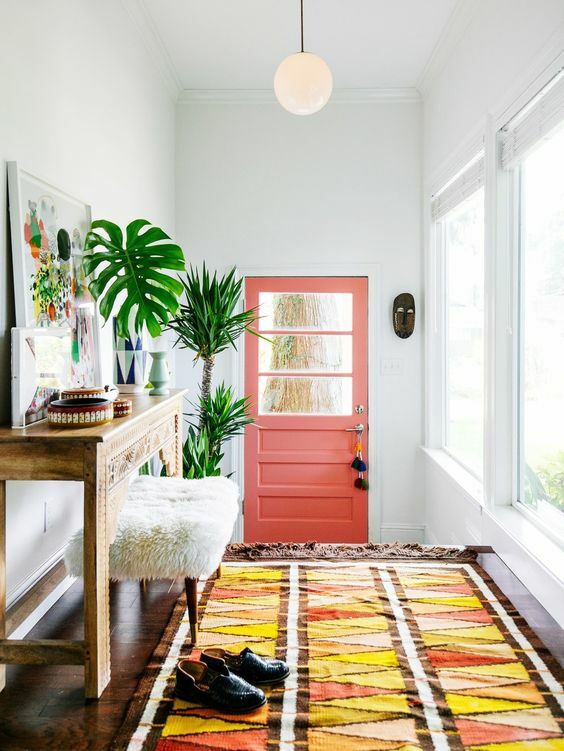 Pinks and reds were popular with more definite oranges but it wasn’t until the 1980s and the excesses of that decade that we saw Coral again – think Miami Vice. 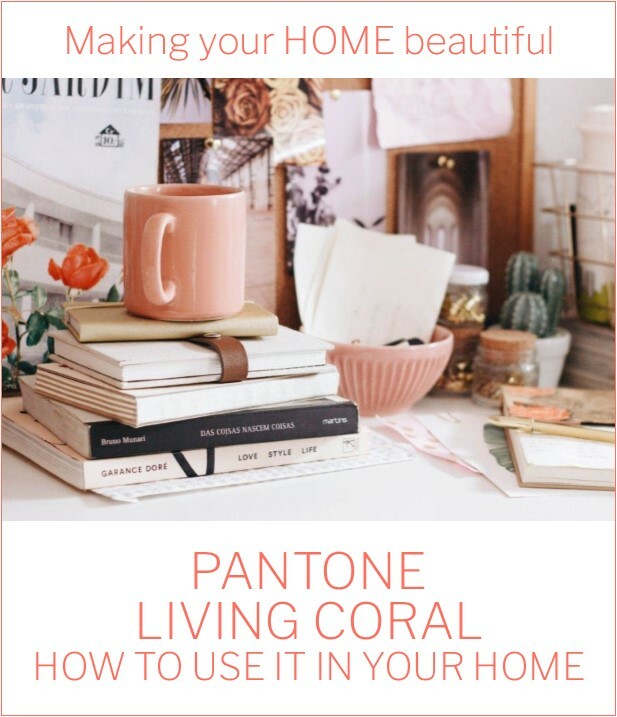 So based on its popularity in the roaring 20s and its resurgence in the economic boom of the 80s, I believe that Pantone Living Coral is a colour which indicates some optimism for 2019. Orange is the happy colour of the spectrum and lovers of this colour are sociable and gregarious individuals who love to entertain and are often urban dwellers fond of the arts and culture. Definitely some good reasons to include this colour in your home. 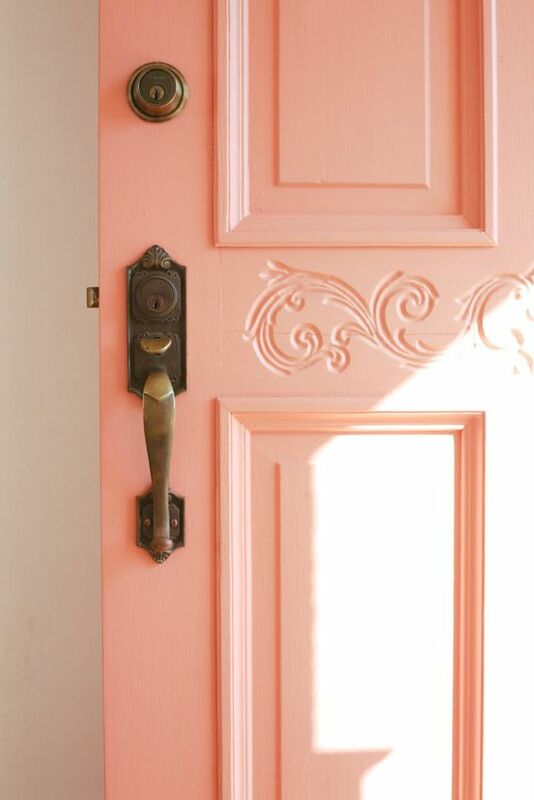 One of my favourite ways to introduce some accent colour is on your front door. By painting both sides of the door the same colour you get to cleverly introduce a strong accent without it being overwhelming. This is my take on the old feature wall colour. 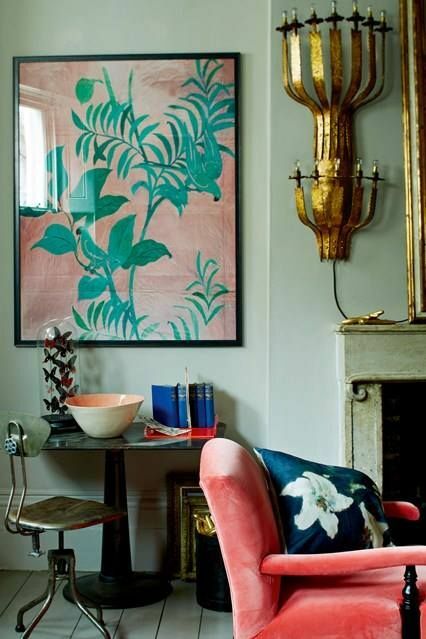 A colour very similar to Pantone Living Coral has been used here and it makes a great uplifting statement. Related: What should you paint on the inside of your front door? Artworks of course are a great way to introduce some colour as an accent and coral tones work well as they make quite a statement. 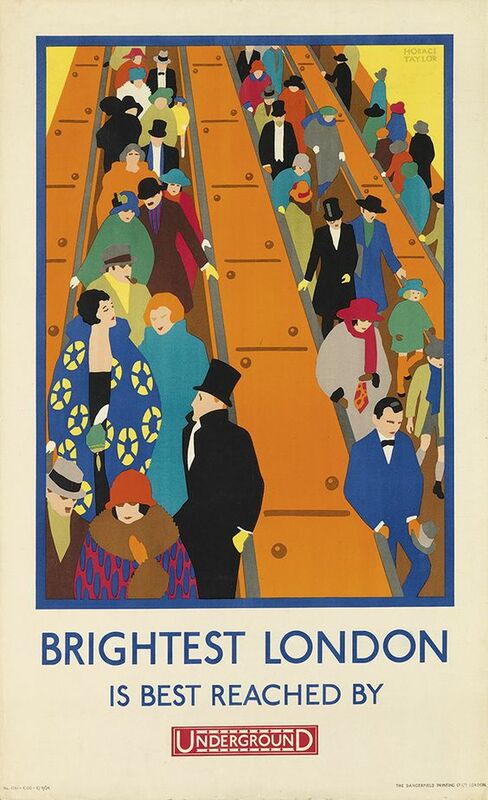 The introduction too of a vintage travel poster is a good way to bring in this colour and also to add some individual personality to your space. Gone are the days of the traditional 3 piece suite where your sofas and chairs had to match. Now you can have a statement sofa or if you are less adventurous a statement chair and if you love these warm orange/pinky tones then this is a great place to introduce them. Orange is the warmest colour of the spectrum, it can lean towards its neighbour yellow or as in Pantone Living Coral, slightly more towards red and therefore has some subtle pink undertones. Wherever it leans, it can never be cool. This can therefore make the colour overwhelming which is why it is often not seen as an obvious favourite, particularly in interiors where cool whites, neutral greens and classic blues are more often the order of the day. However you can cool orange down considerably with greens and blues which are the opposite colours in the spectrum. I particularly like Pantone Living Coral with a soft green – not one that is too neutral but rather a prettier one as in the living room above. 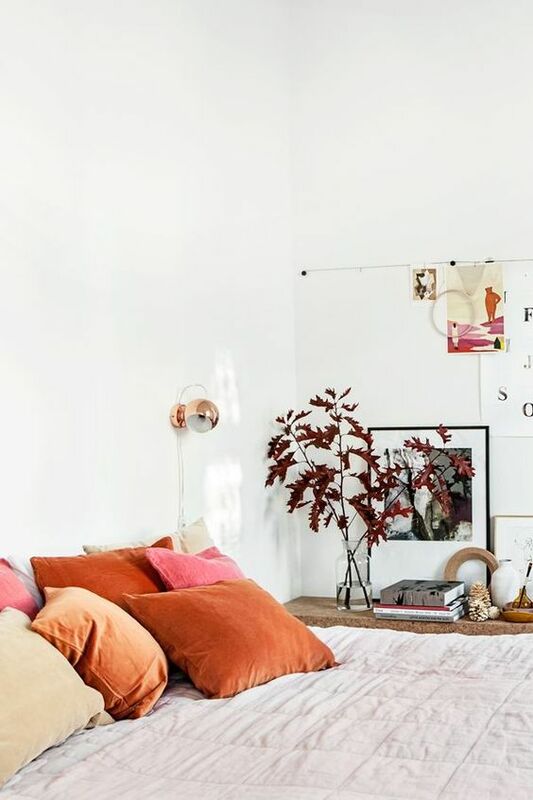 A related colour scheme is one of the simplest to work with so look at partnering Pantone Living Coral with deeper orange hues and dusky pinks. With a background of predominantly white and timber tones, you can’t go wrong. Neutral tones of timber and white as the main background colours will also work very well to temper the warmth of the orange. I love to look to nature for colour palettes and this beautiful image by photographer Annie Spratt gave me a great image to work with. Accompanying the coral here are soft dusky pinks, a warm white and tan and green neutrals. I can see this working really well for interior schemes. 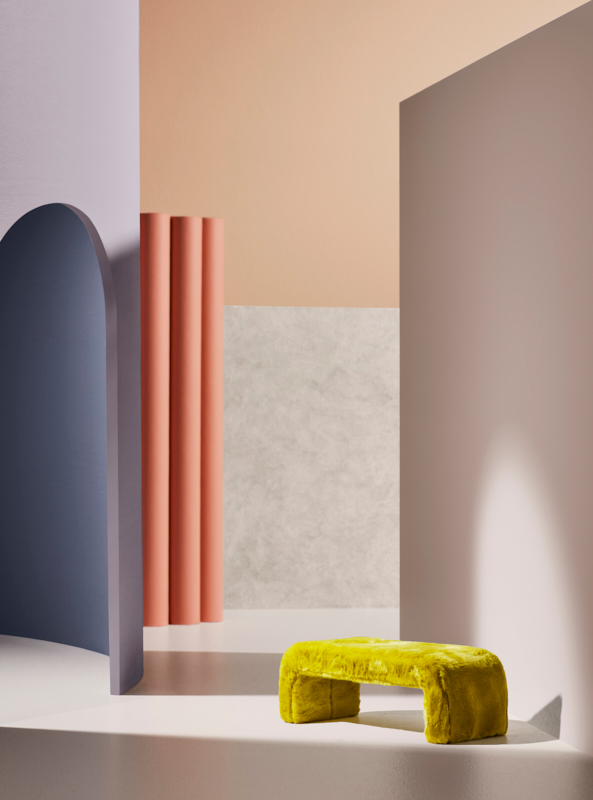 Dulux Australia predicted the use of coral tones in their 2019 colour forecasts. 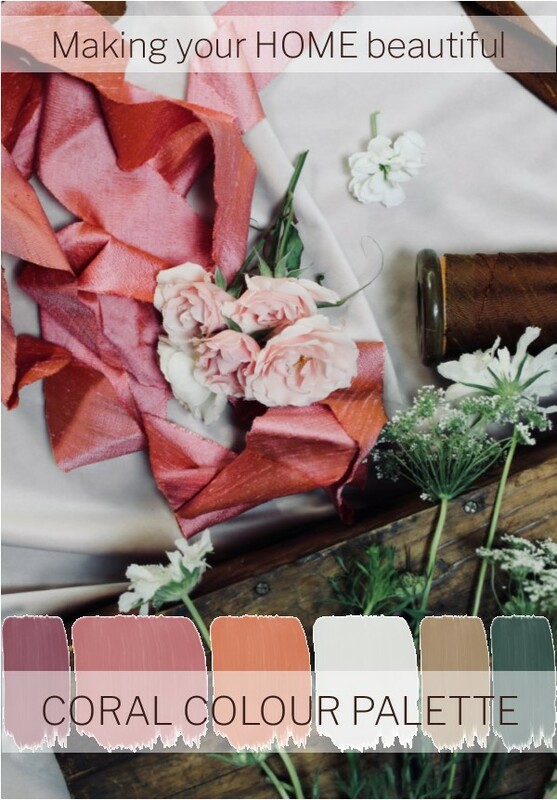 The colour forecasters at Dulux have named the above palette Wholeself, which in their words “subtly intermingles warm, soft blushes with refreshing hints of grey-green. Likewise, enticing neutrals and glamorous golds are tempered by a cool base of mauvey-greys”. This palette has been put together by them to create calm environments where we can reconnect. Turn off the digital devises that we are reliant upon and relax in a distraction-free zone. I would love to hear whether you will embrace this colour and if you start to notice it in the shops throughout 2019.